I'm a veteran trend-tracker and it came as no surprise when friends and colleagues started forwarding an article from Bloomberg about the rise of the automated robo-advisers. These were initially used as low-cost platforms for millennials to build their investment portfolios, but are now being embraced by more affluent investors. This is a classic "disruptive innovation", as defined by Harvard Business school professor Clayton Christensen in The Innovator's Dilemma: When New Technologies Cause Great Firms to Fail. Christensen explains that "disruptive innovations (are) technologically straightforward, consisting of off-the-shelf components put together in a product architecture that is often simpler than prior approaches." Disruptive innovators offer less of what customers in established markets want. Instead, they choose to satisfy emerging customers outside the mainstream. In this case, that would be emerging investors from the millennial generation who are looking for basic, no-frills advice. Since 2012, robo-advisers such as Personal Capital, Betterment, SigFig, and even "me too" offerings from Schwab and Vanguard, have been marketing aggressively on social media. 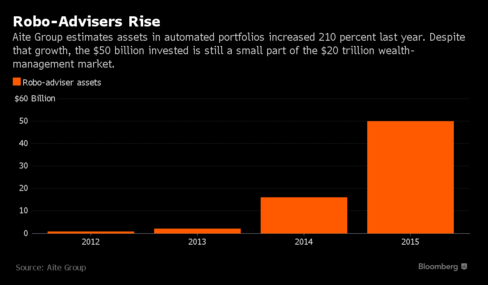 In the past four years, the assets under management by robo-advisers have grown to $50 billion. Wealthfront advertises itself as "the most tax-efficient, low-cost, hassle-free way to invest." Their management fees are low at 0.25% per year. This is part of their appeal, especially during what has been a flat market environment for stocks. However, it is worthwhile to look at their portfolios, which are interesting simply because they are so bland . Building portfolios of index funds just isn't that complicated and doesn't actually require a robo-adviser (although it does sound kinda cool). Overall, it is a perfectly reasonable place to get started. Once you get behind the glossy web-based interface, you'll find a very old-fashioned approach to investing. This is what people miss -- the backbone for most robo-advised portfolios is based on Nobel prize-winning theory.... from the 1970's. And here I'm talking about modern portfolio theory (MPT). The emphasis on index funds was heavily influenced by Burton Malkiel's classic book, A Random Walk Down Wall Street , written in 1973. More recent results have been mixed -- index funds have, in fact, outperformed more active strategies, but the returns of MPT-based portfolios have lagged the performance of the S&P 500 for several years now. Many personal advisers (including myself) still believe in MPT and a more generalized use of diversification as a way to manage risk. However, these tools are simply not the beginning and end of investment management. Almost all robo-advisers are still missing out on much worthwhile research written during the past thirty-years. This includes Rob Arnott's work on alternative indexing strategies , Jeff Hirsch's data on seasonality effects and investment returns, Sam Stovall on the persistence of price momentum, and Richard Thaler's pioneering studies in behavioral finance. These ideas can outperform the market by understanding the circumstances in which markets are inefficient - something that standard index funds (by definition) will never do. Robo-advisers seem to be picking the low-hanging fruit. They don't manage portfolios of individual stocks, can't handle options, and still offer only very basic financial planning advice. So, if robo-advisers are now doing the "easy work", more human financial advisers need to focus on doing the "hard work" of managing client relationships, identifying risks, researching ideas, and thinking outside the box. What happens to a market if everyone makes the same decisions? When do obvious choices lead to less-than-obvious outcomes for investors? Index investing has become so popular over the years that we are beginning to see some rather interesting paradoxes. Specifically, those stocks that are held in popular large-cap indexes, such as the S&P 500 and the Dow Jones Industrial Average, have been performing better than the average investor. Yet, that same outperformance is also leading to higher levels of potential risk in so-called "safe stocks." The S&P 500 is an example of a capitalization-weighted index. The recipe is simple. Take 500 of largest companies in our country. Big companies get a bigger slice of the pie (proportional to size). Right now, the largest slices belong to Apple, Microsoft and Exxon Mobil. The chart below summarizes the relationship between company size and returns this year. It appears that bigger really is better. Year-to-date through November 30th, the S&P 500 Total Return Index is up 3.0%. People are all making money, right? Well, yes and no. The ratio of stocks with gains to those with losses is very close to 1:1. Ranked by performance, the top 20 stocks in the index have gained an average of +61%. The remaining 480 stocks in the index have lost an average of -0.5%. To make things simpler, just six large-cap companies have contributed all of the gains for the S&P 500 this year. These include Amazon, Alphabet (formerly Google), Facebook, Microsoft, GE, and Apple. Smart people ask all the right questions. They go to good schools, get the right jobs, and go on to have successful lives. Really smart people ask all the wrong questions. These are the troublemakers of the world. They ask the all wrong questions for all the right reasons. They make great entrepreneurs, but often find themselves in conflict with authority figures. Really, really smart people know to just keep quiet, or ask simple questions that are almost entirely incomprehensible. My father would open up casual family conversations with questions like "how can you measure the molecular weight of clay? ", or, "how can you determine the concentration of dust in air? ", or "why is it that you can see a small object behind a much larger object during an eclipse?" My father's conversational response to the last question is that gravity bends light, and that theoretically, it might be possible to see far away objects using a gravitational lens. There was little reason to watch Carl Sagan on TV, when you could have dinner with Dad. As a finance guy, I'm fairly obsessed with the question of "what comes next?" Statistical pioneer Jim Hurst once said that 75% of forecasting is about finding the right trends, and 25% is about understanding cycles. Next month, I'll be hosting an event at the Grand Opera House and sharing some of the biggest trends for the next decade (details below). This is really fun stuff. But there is simply so much information to provide that I won't be able to talk much about cycles, which I hope to do here. One of the most statistically significant cycles is happening right now. And it occurs without fail. It is called "autumn". This time of year, people get serious about their finances. Worst-case scenarios are the B-movies of the foresight world. Cheap, dramatically compelling, and easy to make -- these stories are as popular with media pundits as they are with Hollywood producers. Yet, we are all getting fatigued by the drama of apocalyptic narratives are looking to co-create a better world. We need more positive visions of the future. Are you looking for peace of mind and significantly improved monthly cash flow? This could be a great time to pay down or pay off your mortgage. There is a certain sense of euphoria that comes with paying off a mortgage, or making the last payment on a car loan. Your monthly expenses drop significantly, and you now have cash flow for savings, spending, or maybe working just a little bit less. Retirement is much more achievable if you own your own home. Let’s look at some different options for “safe money.” 30-year fixed mortgages average about 3.9% in the greater Philadelphia area, according to BankRate.com. Meanwhile, current rates for 1-yr CD’s average 0.27%. Five-year U.S. Treasury bonds yield 1.5%. Five-year fixed annuities pay about 2.5%, depending on the issuer. 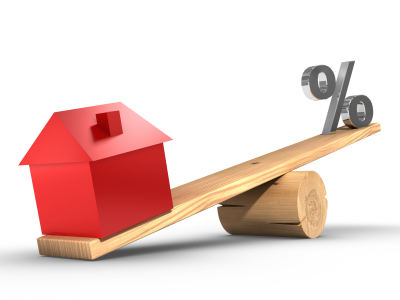 Comparatively speaking, you may be paying a higher rate on your mortgage than you are receiving from some of your investment holdings. Carrying a mortgage does offer a tax deduction on the interest paid each year. However, this tends to decline over time, and may be reduced further if you are subject to AMT (Alternative Minimum Tax). Depending on your situation, it may be possible to obtain a greater tax benefit by paying off a mortgage, and increasing monthly contributions to a 401(k) or other retirement plan. This all suggests that owning low-rate bonds and CDs might not always make sense, particularly if you still have a mortgage. Keep in mind that it is always good to have a small nest egg available to cover life’s surprises, but if you want real stability and security, it may also makes sense to own the roof over your head. Disclosure: Information contained herein is for educational purposes only and is not to be considered a recommendation to buy or sell any security or investment advice. Consult your advisor.